Had a chance today to run by our university's football stadium. The new turf is about 95% complete. 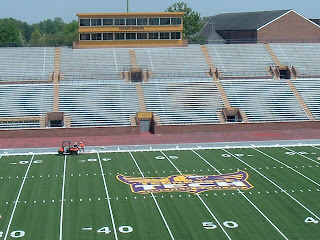 The logo looks great on the new field. With Cookeville native Watson Brown returning home to coach along with the wonderful improvements to the stadium, our community is really excited about college football returning this fall. We have several Thursday night games. This will help the attendance greatly....GO TECH!